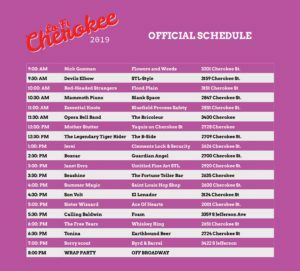 Lo-Fi Cherokee is back again this year to make 19 music videos featuring some of St. Louis’ top local talent as they play in various locations along Cherokee Street. What makes Lo-Fi Cherokee so unique is its ability to showcase not only the STL music scene, but also one of St. Louis’ most dynamic commercial districts; all while bringing together people through their love of music, video, culture, and ultimately St. Louis. The way the event works is that each musician is filmed and recorded performing in only one take and almost immediately the editing process begins. Throughout the day, fans travel up and down the Cherokee Street Business District catching performances at each stop. Previous performance locations have included a flower shop, microbrewery, bike shop, clothing store, bars and restaurants, and even a chemical safety office. At the end of a long day of filming and recording, everyone celebrates with a wrap party and the music videos are released about a month later at a separate event. This year’s event will take place on Saturday, April 6th from 9:00am until 7:00pm at various locations along Cherokee Street. You can view the schedule of performances below and stay tuned to the Facebook event page for updated information. And did we mention it’s free to attend any of the performances?! The music video premiere party will take place on Saturday, June 8th at 7:00pm at The Stage at KDHX.